During the build process there are influences that are often requested which we may have been used on other creations in the past. The policy at the shop continues to be one of originality for each and every machine. To incorporate a balance between innovative and historic ideas we have made an allowance for certain influences to permeate into an entirely new build.This particular 550, named ”Ink Blue 550” resonates with this philosophy. 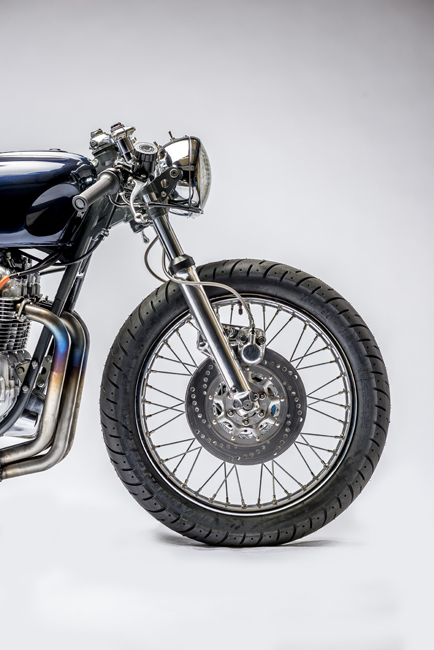 Having already used this particular color on a well received cb350 platform, the decision was made to translate the same deep black and blue finish onto the 550 donor. 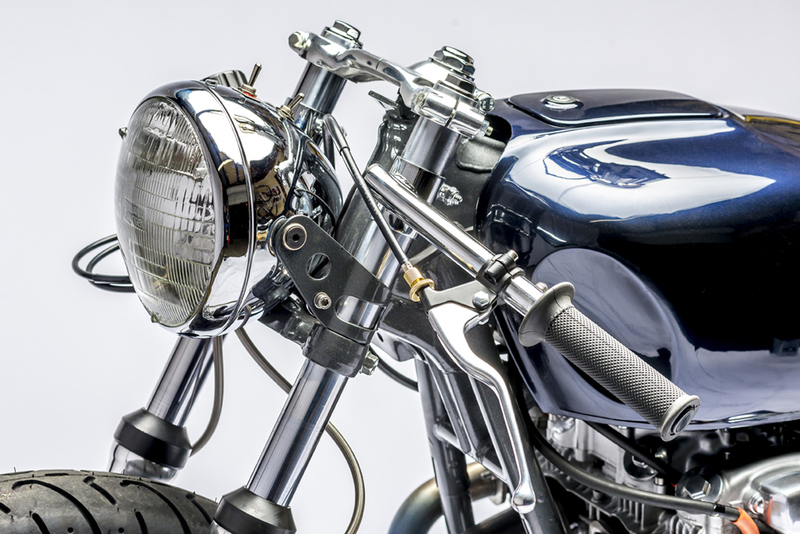 The color was cleverly appropriated into the raw steel headers that have a rich blue hue from the exhaust exiting the freshly built 544cc engine. A standard rearset plate for the ”Iron Glimmer” powdercoated 550 frame continues to be a staple signature piece that facilitates the original triangulated frame rail for optimal ride position. As with all Kott builds a hand built seat cowl not only houses the brand new electrical system and battery but introduces a seamless line throughout the build and creates an ergonomically ideal seating arrangement. Knee indentations and handlebar cutouts have been carefully positioned to maximize the machines steering radius and to make an allowance for additional rider comfort. Along with the color and chassis features of this bike, black leather and minimal chrome accents have created an understated and classy appearance for another one of a kind motorcycle. This build currently resides in Indiana and was shown in issue fourteen of Iron and Air magazine.